New England decor has always focused on furniture made from local woods. Besides the Maple Syrup we all enjoy, furniture made from Maple has a rich hue that is just right for a New England inn. 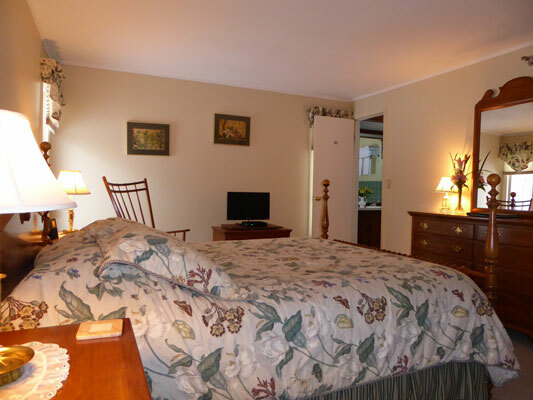 Room 4 at Birch Ridge is furnished in a Colonial style with brass "candlestick" lamps and oriental accessories. 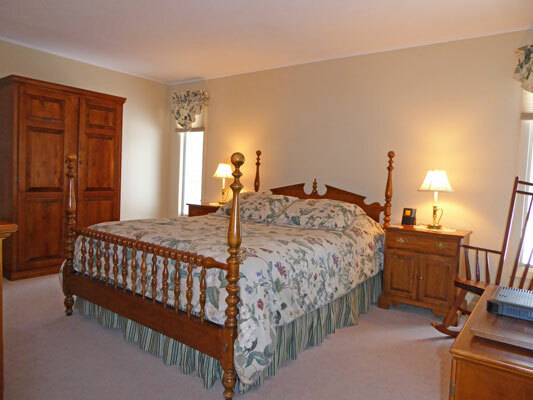 A Queen sized Maple spindle bed sets the decor for the room. To compliment the spindle bed, Mary and Bill had a local Vermont woodcrafter make a Maple Armoire for Room 4, instead of a traditional clothes closet. Armoires were originally used in country homes in New England to avoid British taxation. In colonial times, building taxes were often based upon the number of "dressing rooms" in the house. "Dressing Rooms" were identified by the tax collectors as rooms containing clothes closets. To avoid the tax, many colonial homes were built without clothes closets, the residents instead choosing to use large chests, or "Armoires" to store clothing. In addition to the Armoire, you will also find a comfortable spindle rocker and several oriental prints to complement room 4's decor. Like all rooms at Birch Ridge, Room 4 includes complimentary WiFi internet access, a private bath, a HD television and an alarm clock with usb charging port. Use our Room Rate Calculator to start planning your vacation in the Colonial Maple Room.